World Trump welcomes Americans freed by North Korea back to the U.S.
Trump welcomes Americans freed by North Korea back to the U.S.
President Donald Trump speaks as he stands with Tony Kim, second left, Kim Dong Chul, center right, and Kim Hak Song, right, at Andrews Air Force Base in Md., Thursday, May 10, 2018. 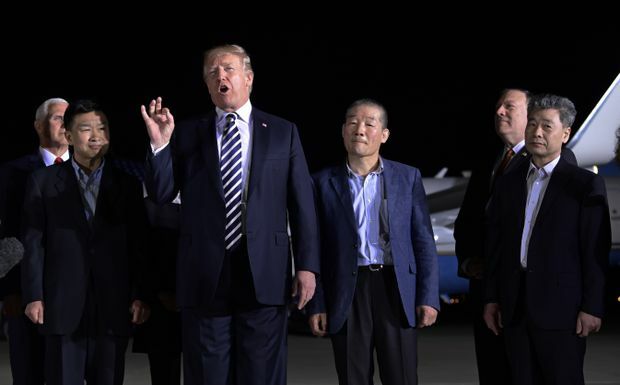 Three American prisoners freed from North Korea arrived here early Thursday to a personal welcome from President Donald Trump, who travelled to an air base in the middle of the night to meet them. Waving their hands and flashing peace signs, the freed prisoners – Kim Dong-chul, Tony Kim and Kim Hak-song – descended the stairs of their plane, flanked by the president and senior administration officials, including Secretary of State Mike Pompeo, who had flown to Pyongyang, the North’s capital, to secure their release. Their return to the United States removed a delicate obstacle as the president prepares to sit down with the North’s leader, Kim Jong-un, for a landmark nuclear summit meeting. But as Trump basked in the glow of floodlights and TV cameras, he indicated that the most difficult part of the negotiations, which include persuading North Korea to dismantle its nuclear weapons program, still lies ahead. As he is prone to do when it comes to negotiations with the North, he avoided striking a decisive tone. Trump, who spent the early part of his week frustrated by news reports about a continuing investigation into his presidential campaign’s ties to Russia and faced with criticism from key European allies for withdrawing from the Iran nuclear deal, seemed eager to celebrate a foreign policy triumph. Vice President Mike Pence and his wife, Karen Pence, Pompeo and first lady Melania Trump were among those who travelled to the base to welcome the three men. Hours earlier, Trump had mused on Twitter about barring the news media from future events because of displeasure over what he perceived to be negative coverage of his administration. But dozens of journalists assembled at the air base early Thursday, training their cameras on Trump, the freed prisoners and a large American flag that had been strung up on the tarmac. The arrival of the men in Maryland capped a whirlwind journey for Pompeo, who secured their release during a 13-hour visit to North Korea to arrange the summit meeting. The president spent the hours before their arrival in a celebratory mood. He mentioned in a Cabinet meeting that “everyone thinks” he deserved the Nobel Peace Prize for overseeing the prisoners’ release. The president had also posted excitedly on Twitter that he planned to greet the “Hostages (no longer)” upon their arrival. Their plane touched down just before 3 a.m.
Trump, who delivered on a long-held promise this week by ending the United States’ involvement in the Iran nuclear deal, has sought to deliver on another by improving relations with North Korea after nearly seven decades of mutual antagonism. Analysts are watching the negotiations closely to see if the return of the prisoners is a gesture of genuine goodwill from the North, or if Kim will ultimately use the release of the men as leverage for prolonging the time frame for reducing or completely dismantling North Korea’s nuclear abilities. Trump said Thursday that he would meet Kim in Singapore, a neutral site, on June 12. President Moon Jae-in of South Korea will visit the White House beforehand, on May 22. Other administrations, including President Barack Obama’s, secured the release of imprisoned Americans without promising a summit meeting or improved diplomatic relations. Over the past week, Trump had criticized the Obama administration for failing to secure the release of the three men, who had been held on charges of committing espionage or “hostile acts” against North Korea. Two of them were taken prisoner after Trump took office. The three men include Kim Dong-chul, a businessman and naturalized American citizen from the Virginia suburbs of Washington. He had been sentenced to 10 years’ hard labour in April 2016 after being convicted of spying and other offences. Tony Kim, also known as Kim Sang-duk, was arrested in April 2017 while trying to board a plane to leave the country. He had spent a month teaching accounting at a Christian-funded school, Pyongyang University of Science and Technology. Kim Hak-song, who volunteered at the school’s agricultural research farm, was arrested in May 2017. According to CNN, he was born in China near the North Korean border and emigrated to the United States in the 1990s, later returning to China and eventually moving to Pyongyang. Speaking through a translator, one of the men recounted his time in captivity, describing long days in labour camps but adding that he had received medical treatment when needed. Shortly after meeting Trump, the released Americans were transported to Walter Reed National Military Medical Center for further evaluation. Maj. Carla M. Gleason, a Pentagon spokeswoman, said the men had “demonstrated significant emotional and physical resiliency,” and that the most crucial aspect of their recovery would be establishing a routine, focusing on nutrition and keeping “stimuli” to a minimum in the short term. Their release bears a striking contrast to Otto F. Warmbier, a University of Virginia student who was returned to U.S. custody in June after spending 17 months in captivity, much of it in a coma, in Pyongyang. He died days later. As the president prepared to see the men away, he turned back toward the floodlights. “I think you probably broke the all-time in history television rating for 3 o’clock in the morning,” Trump said. Minutes later, he boarded Marine One back to the White House.